Why should I join the NBHA? *You will become part of an international barrel racing organization developed to improve your sport, making it better for you and all other barrel racers. *The sanctioning power of the NBHA CANADA helps to improve conditions at existing shows and to upgrade arenas to meet NBHA CANADA safety standards and show requirements. 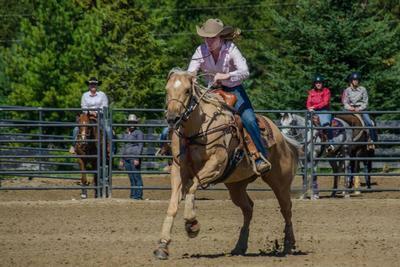 *You can ride in sanctioned shows, close to home, to compete for NBHA CANADA points and prize money and qualify for year-end awards, Provincial, National and World Championships. *The NBHA CANADA is designed primarily for the local weekend competitor. You will have the opportunity to compete for more prize money and awards plus district, and Provincial, National and World titles. The NBHA CANADA 4-D format means more entries and larger purses, but more importantly, it gives YOU a fairer chance to win! *As you join forces with other barrel racers around the world, the NBHA CANADA is attracting additional national and regional sponsors who are bringing more prize money, awards, benefits and publicity to our sport. Once your membership is accepted, you will receive a membership card and rule book. You will also receive a one year subscription to the Barrel Horse News. The NBHA is for ALL barrel racers, from beginners to experts. So whether you’re a local weekend competitor or a professional trainer, this is the association for you. How Can Beginners Compete with Pros? The NBHA CANADA uses a four division (4D) format. This makes it possible for the beginner, intermediate and advanced barrel racer to compete in the same event. Meaning, there are 4 different sets of winners within the event. There are three NBHA CANADA 4D classes: the Youth 4D (18 and under), the Open 4D (for every age group), and the Senior 4D (for competitors 50 yrs and up). NBHAC forms and documents are in Adobe Acrobat PDF format. You need to have Adobe Acrobat Reader installed on your computer in order to properly read & print these files. To download and install a free copy of Adobe Acrobat, click here.